True, global auto parts maker Motherson Sumi Systems Ltd has turned in a decent December quarter operating performance on the back of a 36% revenue surge. However, the firm’s rich valuation of 29 times the estimated earnings per share for FY19 warrants a ramp-up in profitability even as the management claims to be well on track to achieving its revenue target of $18 billion by 2020. Motherson Sumi’s overseas operations comprising several acquired entities currently contribute about 83% of consolidated revenue and 72% of earnings before interest and tax. For the quarter, the 36% jump in revenue year-on-year to Rs14,271 crore included a 20% rise in stand-alone sales and a 38% jump in overseas sales. Note that the latter included the recent acquisition of Finnish firm PKC Plc that perhaps fuelled the year-on-year growth in revenue. What’s important for the Street is profitability. Note that the consolidated operating margin of 9.7% (excluding start-up costs provided for in the profit and loss statement) may have matched investor expectations, but it was 110 basis points lower than in the year-ago period. The stand-alone entity posted a substantial drop in operating margin on account of increasing copper prices. That adversely affected the quarter’s margins. 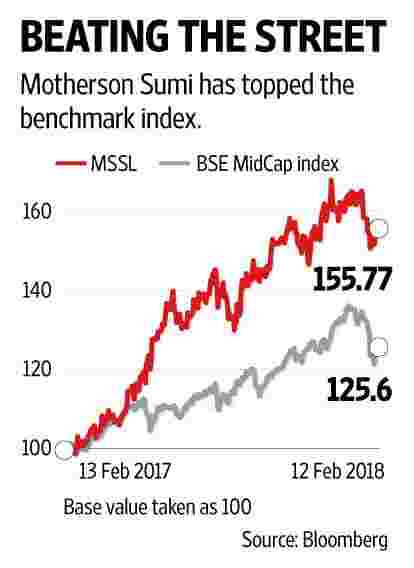 All eyes are now fixed on Motherson Sumi’s overseas business, which is more material to consolidated profit growth in the next two years. For the quarter, margins of its two key overseas entities—Samvardhan Motherson Peguform and Samvardhan Motherson Reflectec—were stagnant. Even the newly acquired PKC reported a drop in profit margin, which the management said was due to divestment of its light vehicle business. According to Emkay Global Financial Services Ltd, the European performance was negatively impacted by disruption in supply of materials from vendors, which led to extraordinary freight and labour expenses. Another concern on Motherson Sumi’s growth stems from the recent turmoil in the overseas vehicle market, where the strong shift towards non-diesel and electric vehicles is leading to a slowdown in sales in Europe and North America. Although it is too early and hard to forecast at this juncture, analysts believe that there may be a temporary blip in sales of component suppliers too. That apart, Motherson Sumi’s consolidated annual revenue for FY18 is likely to touch $8.5 billion. Whether it will reach its target of $18 billion revenue in the next two years is anybody’s guess. Moreover, while the Street has got accustomed to the firm’s high growth rate through the inorganic route, any compromises on profitability will be viewed negatively. Both revenue and margins need to tango to sustain the rich valuations.